1. To make the bacon-infused maple syrup, place the bacon on a baking tray lined with parchment paper. Put in a preheated oven at 180oC, gas mark 4 for approximately 18 minutes or until crisp. Chop the bacon and add to the maple syrup. Allow to infuse for 1 hour. Strain the bacon and reserve for use in another dish. 2. To make brown butter, melt the butter in a small saucepan until it’s golden brown and smells nutty. 3. Add the flour, sugar, baking powder and salt to a bowl and mix well. Put the egg whites in the bowl of a mixer fitted with a whisk until stiff. 4. Add the milk, brown butter and the egg yolk to the dry ingredients and mix until just combined. Once the egg whites are done, gently fold through the mixture. 5. Place a non-stick pan on medium heat, once hot, add a ladle of batter to the centre of the pan. Allow to spread evenly. Cook for between 90 seconds to 2 minutes or until bubbles begin to appear on the surface and the edges have dried out. Turn the pancake and cook for a further 60 seconds or until golden brown. 6. Repeat with the rest of the batter to make 7 more pancakes. 7. 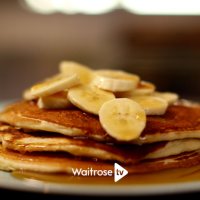 To finish, serve the warm pancakes with slices of banana on top and drizzle some of the bacon-infused syrup. This recipe was first published in Fri Feb 13 09:57:27 GMT 2015.